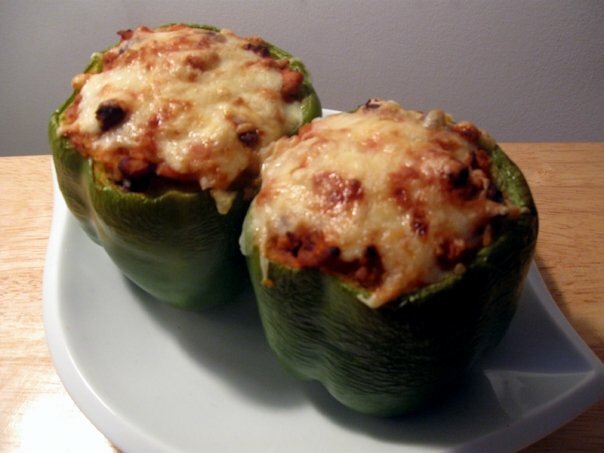 Lo-Fi Food: Ground Beef And Rice Stuffed Peppers - Gluten-Free! Ground Beef And Rice Stuffed Peppers - Gluten-Free! 1. In a small pot, could 1/2-1 cup of rice, and set aside. I find it's easier to cook the rice ahead of time, instead of trusting that it will cook and soak up enough liquid inside the pepper. 2. Cut some large green peppers open from the top, and de-seed. And then dice up some onions into small pieces, and crush some garlic. Set aside. 3. In a bowl, mix your ground beef, rice, canned tomatoes, onions, garlic, salt and pepper, cayenne together. Fill each green pepper up with this mixture. And top with shredded cheese. 4. Put in the oven at 400 F, for at least 30 minutes. Until the cheese because golden brown, and the ground beef is cooked. Broil for a few minutes if cheese doesn't look golden enough. When the green peppers change to a more desaturated yellow from the green. That is when you know they are ready, or almost ready.